As the discussion on the positives vs negatives of coffee on our bodies rages on, I unequivocally fall into the category of coffee lovers. My acupuncturist has been trying to gently convince me to give it up, but I tell him time and time again that I would rather give up watching the news, that aren’t good for hearts or minds, than give up my daily cups of coffee. A few weeks ago I started a dialogue with an Australian brand called Frank Green, across which I came on Instagram, and they very kindly sent me one of their Smart Cups for testing. My coffee might be iced at times, but I couldn’t have asked for a better time to test SmartCup, as summer means more time spent outside and more travel adventures! I have gone through my fair share of coffee cups in the last couple of years and without sounding preachy, I believe that a reliable & portable coffee (or tea, as I love tea too !) cup is a worthy friend, who helps with recycling and makes our planet more environmentally friendly. Think of all the cups that are thrown away daily vs one that you carry with you or travel with? Just one reusable SmartCup can offer a saving of 10-25p for the cafe you get your hot drinks from for every disposable cup avoided – this can lead to a saving of about £50 per customer per year. Until recently my relationship with portable coffee cups has been fractionate. Bodum one leaked mercilessly, even though it had a reliably looking screw-on lid. Another one from a brand which name I sadly can’t recollect had the same problem after six months of use, when the silicone closure started leaking too. I recently bought a lovely one from eCoffeeCup, as it was made from recycled bamboo and recommended by the lovely Nath, founder of resourceful Beautycalypse blog. The cup really appealed to my inner panda, yet I clumsily dropped it a few days after buying it & a big chunk of it broke off. But I wasn’t giving up in my search for a trusted coffee side-kick & then SmartCup came along…. Frank Green is an Australian brand, which is now sold around the world. The philosophy behind the design is simple – create innovative products that are stylish, functional & good for the environment. Sustainability is becoming a more pressing issue and even my kids are on the subject regularly, chiming in with their ideas. I tell them off for using plastic straws, they carry their Swell drinking bottles with them everywhere. Little steps lead to a big progress! 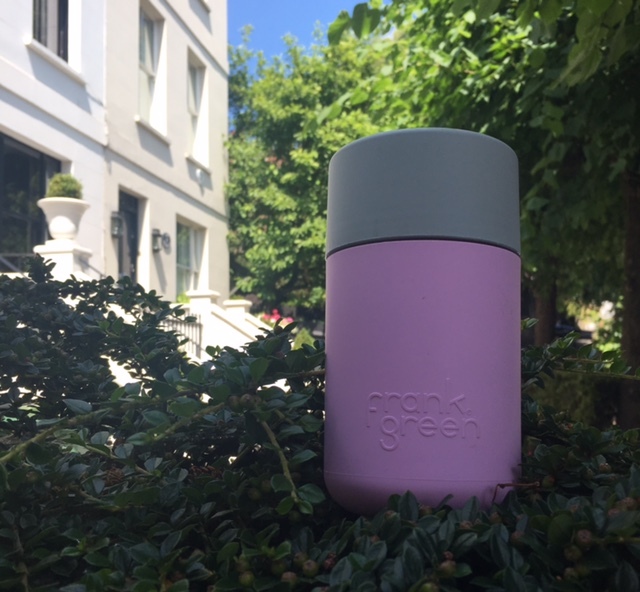 Having a cool reusable product isn’t just a slogan for Frank Green and since I started carrying my SmartCup around, it has become a starter point of many conversations. This cup supports local industry and is designed, engineered and made in Australia. It comes in two sizes regular (230ml/8oz) or large (340ml/12oz). It is made from stain and odour resistant materials – so you can keep any hot beverage – coffee, tea, miso soup, hot chocolate in it and provided you wash it well between uses, there is no residue, nor aftertaste with regular use. You can wash it into dishwasher, but I prefer to do it with my own hands! It also feels great in the hand when you carry it around and its non-slip grip is perfect for those of us who are rushed or clumsy! Its shape fits perfectly into cup holders in the car, so no adjustment is required! Another handy feature is its smart double-walled thermo plastic outer layer that helps keep hot drinks warmer for longer than your average reusable cup – it certainly towers, not just wins, compared to the steel Bodum cup! The SmartCup also has a clever push button to keep the spill-resistant lid open or closed, so if you are rushed in the morning, you won’t pore it over people or yourself on the public transport. Another great feature of this cup is that you can choose from plenty of colour options when you order your cup. My funky personalised one has coral/orange body, green lid and a yellow push button and I revel in the sunny brightness it brings, as soon as it catches my eye. You don’t have to go all Austin Powers like I did though – there are some subdued, more classic colours to choose from ! When I first received the cup, I washed it in warm, soapy water with some Dr. Bronner lavender soap and then let it dry. Make sure not to use abrasive cleaners, in order not to damage the cup! Another good tip is to make sure you don’t overfill the cup – there is a ‘max fill’ line on the exterior of the inner cup, which is easy to see – and screw the lid on fully and securely, but without any force. When I received the SmartCup that was sent to me, a couple of weeks into testing it I realised that it leaked sometimes – ‘oh no’, I said to myself and got in touch with Frank Green customer service team, explaining my predicament. I was helpfully reminded to a) make sure I don’t go beyond the ‘max’ fill line. If you notice a ‘leak’ between base and the lid, it relates to liquid filling beyond the ‘max’ line, and b) make sure I assemble the cup correctly. I was also assured that cups are tested for leaking before the dispatch and with that assurance, within a few days I received a prepaid return envelope, as well as a replacement cup in the colours I asked for. My ‘replacement’ cup has now become an extension of my arm and no sign of any problem after three or so weeks of regular, at time daily use. The ‘original’ cup I was told is now also on good form, after the top seal had been replaced. Why am I telling you this? Well, first and foremost, I believe in honest disclosure and secondly, what’s the point of reviewing something, if I don’t share my full experience with you? We often moan about bad customer service, yet forget to praise good one, so in part, this is my ‘thank you’ to Frank Green & to Rod, who has kindly assisted me and answered the barrage of my questions – always quickly and politely, but no less importantly, very helpfully & insightfully. While I am at it, let me address another issue that might be of interest to some of you. Plastic. I did ask about it and here is a reply that I received:’ We understand that some people have an issue with plastic, however it is the material of choice to deliver a superior reusable & highly transportable cup. Glass & ceramic smash & ours doesn’t leech the taste of plastic into coffee’. I should also add that materials used in the manufacturing of SmartCup are BPA-free. As the cup is doubly insulated, sip your drink carefully, if it was pored quite hot, so not to burn your tongue or your mouth. When the ‘push’ button is in the closed position, hot liquid will naturally cause the steam to build up the pressure inside your cup, so either open the lid or the ‘push’ button to let the steam escape and be sure to do it away from your face – that’s the word of caution on the cup’s instructions, but I never had an issues in that department. After you use the cup, make sure you disassemble it correctly and wash the parts properly – it is easy to do, once you read the instructions carefully (please see the image above) and it will help make sure that the Smart Cup will serve you for a long time. I will also admit to a bout of recent clumsiness & dropping my cup recently – no scratch, no damage, no spill – just a slightly raised heart rate on my part, as the memory of the eCoffee cup flashed through my mind. So practicality, drop & spill tests passed with flying colours, some, it has to be said, unintentionally, as I have no desire to drop my cup full of coffee & make it shaken, like Bond’s martini. Last, but not least, for the tech bunnies among you – you can download the CafePay app, register your details & pair it with your FG SmartCup or smartphone. Then you can make orders with cashless payments & be rewarded for your loyalty with free coffees. However, it will take a few more months for the App to be rolled out and be more widely available. Will the cup hold sparkling water with out damaging it?